This post shares a shocking and counterintuitive fact about studies looking at interactions where effects are predicted to get smaller (attenuated interactions). I needed a working example and went with Fritz Strack et al.’s (1988, .pdf) famous paper [933 Google cites], in which participants rated cartoons as funnier if they saw them while holding a pen with their lips (inhibiting smiles) vs. their teeth (facilitating them). The paper relies on a sensible and common tactic: Show the effect in Study 1. Then in Study 2 show that a moderator makes it go away or get smaller. Their Study 2 tested if the pen effect got smaller when it was held only after seeing the cartoons (but before rating them). 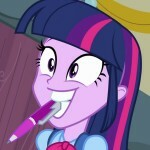 #1 Simple effect People rate cartoons as funnier with pen held in their teeth vs. lips. To obtain the same level of power as in Study 1, Study 2 needs at least twice as many subjects, per cell, as Study 1. Power discussions get muddied by uncertainty about effect size. The blue fact is free of this problem: whatever power Study 1 had, at least twice as many subjects are needed in Study 2, per cell, to maintain it. We know this because we are testing the reduction of that same effect. (Strack et al. do, interpreting the n.s. result as accepting the null of no-effect and hence as evidence for their theory). The math behind the blue fact is simple enough (see math derivations .pdf | R simulations| Excel Simulations). Twice as many subjects per cell sounds bad. But it is worse than it sounds. If Study 1 is a simple two-cell design, Study 2 typically has at least four (2×2 design). If Study 1 had 100 subjects total (n=50 per cell), Study 2 needs at least 50 x 2 x 4=400 subjects total. If Study 2 instead tests a three-way interaction (attenuation of an attenuated effect), it needs N=50 x 2 x2 x 8=1600 subjects . With between subject designs, two-way interactions are ambitious. Three-ways are more like no-way. How bad is it to ignore this? Running Study 2 with the same per-cell n as Study 1 lowers power by ~1/3. If Study 1 had 80% power, Study 2 would have 51%. Why do you keep saying at least? Because I have assumed the moderator eliminates the effect. If it merely reduces it, things get worse. Fast. If the effect drops in 70%, instead of 100%, you need FOUR times as many subjects in Study 2, again, per cell. If two-cell Study 1 has 100 total subjects, 2×2 Study 2 needs 800. How come so many interaction studies have worked? 1) p-hacking: many interactions are post-dicted “Bummer, p=.14. Do a median split on father’s age… p=.048, nailed it!” or if predicted, obtained by dropping subjects, measures, or conditions. 3) Cross-overs: Some studies examine if an effect reverses rather than merely goes away,those may need only 30%-50% more subjects per cell. 5) Bigger ns: Perhaps some interaction studies have run twice as many subjects per cell as Study 1s, or Study 1 was so high-powered that not doubling n still lead to decent power.